Following the launch of Marriott International’s latest seasonal experiences campaign last month, Egypt presents yet again many reasons to travel as an incredible holiday destination that continues to maintain its position on the bucket list of every global traveller. Guests booking a hotel within the Marriott International portfolio in Egypt from now until September 30 will enjoy a mega 20 per cent off, while Marriott International loyalty program members enjoy 30 per cent off. Egypt offers many incredible experiences that go beyond the Pyramids. From breathtaking sights of the river Nile to the magnificent and awe-inspiring monuments, from the beguiling desert to a lush delta, from beaches to a vibrant culture to a rich culinary heritage. Egypt is a country with a great wealth of history that has long been eulogised, fantasised and romanticised. 2. After a day of sightseeing, sit back and enjoy the wonderful summer breeze at Cairo Marriott’s Garden Promenade Café set amidst palatial gardens…a magical blend of history, nature and authenticity. 4. Against the majestic backdrop of the Great Pyramids of Giza, the only remaining Wonder of the Ancient World, have a meal or smoke a flavoured Shisha at Marriott Mena House, Cairo. 6. Spa like a Pharoah: Guests can pamper themselves with an indulgent signature spa treatment - The Peloid Treatment at The Nile Ritz- Carlton. The treatment offers an ultimate full body exfoliation after which different types of mineral mud are applied. Relax in the steam room as the body soaks in the benefits of the mud before it is rinsed off. 7. Rest your head next to King Tut: With a choice of rooms that overlook the Nile and those that offer a marvellous view of the Egyptian museum and the historical downtown and Tahrir Square, The Nile Ritz-Carlton is surrounded with history. 9. Fun-Filled Vacation: The Olympic-sized swimming pool at The Nile Ritz – Carlton is surrounded by 17 luxurious cabanas where guests can relax and indulge in complimentary treats all while enjoying the pleasant Nile breeze amidst lush greenery beneath the shades of the swaying palm trees. The pool is completely family friendly allowing parents the opportunity to truly relax in a tranquil atmosphere. 10. Friday Brunch: Friday brunch at Culina at The Nile Ritz - Carlton Cairo is a must try. A signature brunch in the city, signature dishes are created by the talented chef Carmine who cooked for Pope Francis during his visit to Cairo. Guests can enjoy views of the lush greens of the Egyptian Museum whilst feasting on fare guaranteed to tantalize the taste-buds. Farm to table items are freshly prepared, martini drinks are endless and mouthwatering line-up features a number of cooking stations including sushi, Asian, Oriental, pasta, grills as well as hot and cold mezzes and an array of desserts. For seafood lovers, Culina restaurant also offers sea bass, prawns, crabs, calamari and fish selected from a fresh seafood counter and cooked to order. 14. For an authentic Cairo experience, Egypt’s most favourite oriental meal “koushary”, is a must try. Specially made in a unique way by the head Chef at El Mawardya Restaurant at Sheraton Cairo, you can have your koushary experience overlooking the amazing Nile. 15. JW Marriott Cairo offers a superb family experience; kick off the day with sweeping views of golf course and lakes at Mirage Café offering a range of fresh and delicious international cuisines in a sophisticated yet welcoming environment. Head over to the Beach – Cairo’s only man-made beach and Water Park, or cool off in the famous Cleopatra bay wave pool. 17. Book a favourite massage at the JW Marriott Cairo treatment at the Mandara Spa and enjoy the indoor pool, Sauna, Steam and Jacuzzi, while kids are entertained at the arcades area. 18. Those looking for hidden gems in the city of a 1,000 minarets can visit Zeinab Khatoun house, which is located in the Azhar area showcasing Islamic architecture and offering authentic Arabic shows. Head on to the museum of Gayer Anderson, an art museum situated adjacent to the Mosque of Ahmad ibn Tulun in the Sayyida Zeinab neighbourhood. The building takes its name from Major R.G. Gayer-Anderson Pasha, who resided in the house between 1935 and 1942. The museum is noted for being one of the best-preserved examples of 17th-century domestic architecture left in Cairo, and also for its vast collection of furniture, carpets, curio, and other objects. 19. During sunset, guests at the JW Marriott Cairo can enjoy the beautiful golf course views and lakes by sitting at Plateau sipping on a favourite cocktail and having a bite to eat. 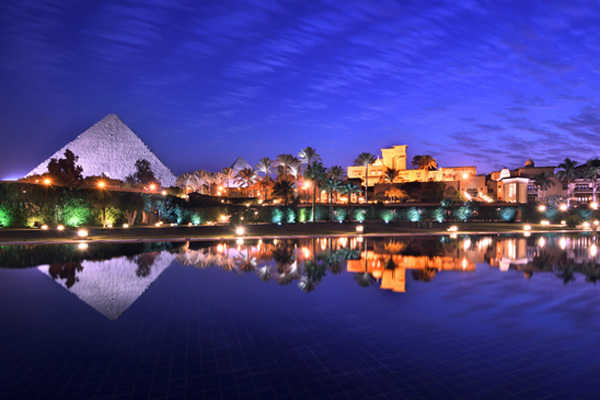 For those looking for a more Cairene experience, enjoy dinner on the Nile cruise overlooking the beautiful night views of Cairo.